The American Society for Quality, touted as the “Global Voice of Quality,” states that manufacturers in the pharmaceutical industry are always working to balance the demands of meeting global regulations and production costs, in an effort to produce the most innovative research and development while also producing safe, reliable prescription drugs. As a biopharmaceutical industry veteran, I know the challenge is real. In fact, when illustrating a graphic representation of the Biopharma industry’s information management landscape, as I see it, the depiction is quite dense and complex. The illustration below is not a complete inventory of all components, activities, or tools within that landscape, but it is representative example of the Information Management Systems used across functional areas. The diagram attempts to illustrate the multiple functions and areas, and the technology enablers that support the duties and objectives of these functions, and the internal and external environments that they impact. This blog offers my perspective on the ‘internal’ environment. When bringing a new drug to the market, once a lead compound has been identified in the lab, key functional areas must be in place, each comprised of specific responsibilities and supporting the drug development lifecycle. The graphic depicts the systems by function and plots them adjacent to their respective relevant departments. Obviously, Information Management Systems are critical to enable every position and level of the organization to manage the vast amount of data and information collected, processed, produced, reported, or required. All these systems, including software, platforms, and solutions, play a strategic role and are determinant for the overall performance to reach objectives and ultimately achieve business success. That broader green circle in the illustration depicts the Quality function — the general umbrella under which all functions/systems must operate. While the Quality function does not relate directly to technology, because it is highly procedural, and links to larger concepts such as Risk Management, overall Quality Systems enable the manufacturer to satisfy compliance mandates. It is interesting that the great majority of the software, platforms, and solutions can be placed around any functional area or information system as they can be used to identify, capture, analyze or report issues, or manage, for instance, changes, documents, or training. For instance, Document Management and Training Management are a MUST for ALL functional areas (e.g. : SOPs, policies, work instructions, protocols, competencies requirements, certifications); Change Control is also relevant to ALL functions; and, when initiating Deviations or taking part in a CAPA escalation, engaging a change control process is a likely scenario that could be applicable to any subject matter expert across the value chain. The same would be true for incidents that may be captured by any functional area, not to mention an Audit Management process which supports the auditing of any functional department. Multiple additional examples could complement this list of key Quality functions such as Supplier Management to on-board, manage, and monitor vendors/contractors (e.g. : CROs, Central Labs, CMOs, technology providers, CT supplies), or the absolute necessity to have a solution for product recalls; and finally of utmost importance, Reporting, Analytics, and Quality Intelligence capabilities to make informed decisions by giving insight into quality data, operations, and across functions for Risk Management and Safety purposes. In other words, Quality Systems support BioPharma functions within the regulatory framework by providing the compliance backbone for risk-based management activities. The table above indicates the Quality-level solutions for satisfying regulatory and business requirements. Those solutions then can ultimately integrate seamlessly with a larger end-to-end solutions platform comprised of expanded capabilities that extend from concept to market, resulting in maximized efficiencies and synergies, reduction in costs and efforts, and greater visibility across stakeholders. 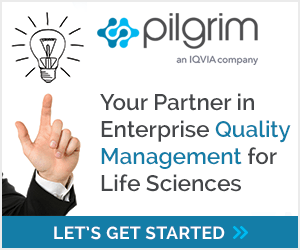 SmartSolve®, from Pilgrim Quality Solutions, an IQVIA company, is an integrated quality compliance management platform that has enabled dozens of Biopharmaceutical enterprises to automate and simplify the complex challenges of quality, regulatory and risk management. Whether your organization needs to develop a risk-based CAPA process, ensure that your team is adequately trained and following procedures, keep suppliers under control, investigate out-of-specification lab results, or structure your pharmaceutical quality system data to support quality metrics and reporting, SmartSolve gives you integrated quality management capabilities to achieve your goals. Learn how Supplier Quality Management can help you implement a risk-based incoming inspection process and much more.